It's been a while since I posted the last 'Where is this?' challenge. If you think you know where it is (or you want to guess) click on comments. Click on the picture to see an enlarged image. Come on! Give it a try! If you think you know where it is (or you want to guess) click on comments. Click on the picture to see an enlarged image. Yeah! Finally! 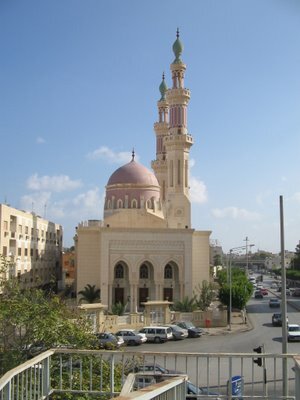 Um Dania's husband said that it's the mosque in the centre of the town of Tahouna. Across the street from the mosque is a memorial - I'm not sure what it's a memorial of, maybe someone knows and can tell us. 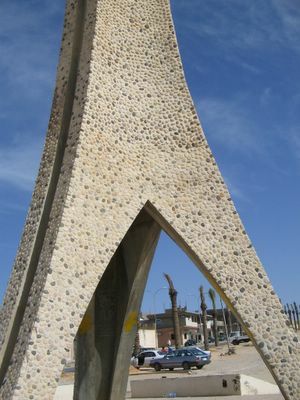 We stopped in Tarhouna for a few minutes the day we went to Ben Walid. We let Ibrahim out to run around the square for a bit and we had a look around. Next to the square is a round-about and while we where there a group of young boys and men were setting up some chairs and dragging out a few gazelles for people to come have their pictures taken with. This is common in Tripoli in the Green Square but I think they where only doing it in Tarhouna because of the Eid holiday. Tarhouna is a hilly area. The town is a little lower than the surrounding countryside. In the picture above you can see the farmland around the city. 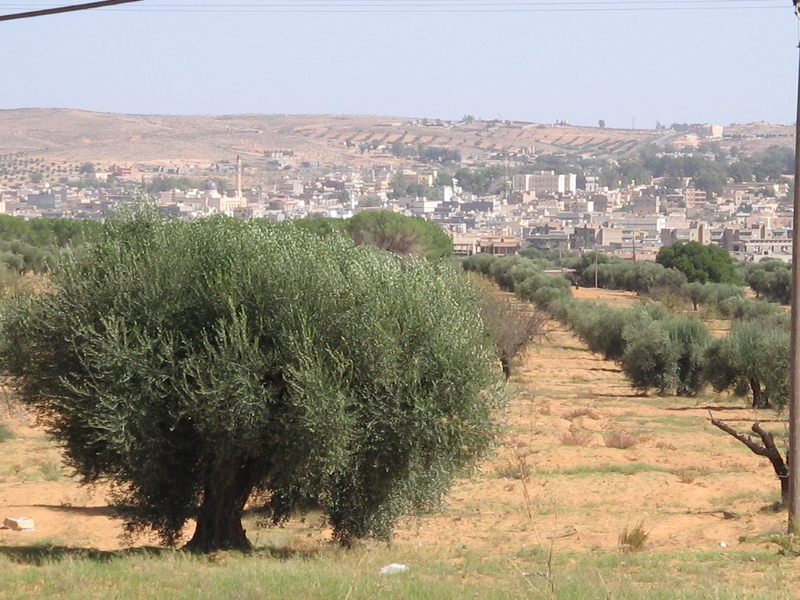 This is the view looking down towards the town from the olive tree covered hills as you approach Tarhouna. Thanks Um Dania for posting your husband's answer! He won! I was led to First Drafts while reading a comment someone had posted on my blog and came across a meme called One Word. I thought it might be useful to do with my students but I decided I would give it a try myself first. It's really hard to come up with just one word to describe something, especially when it's about a person. The ancient ruins in Libya are full of mosaics and they always fascinate me. 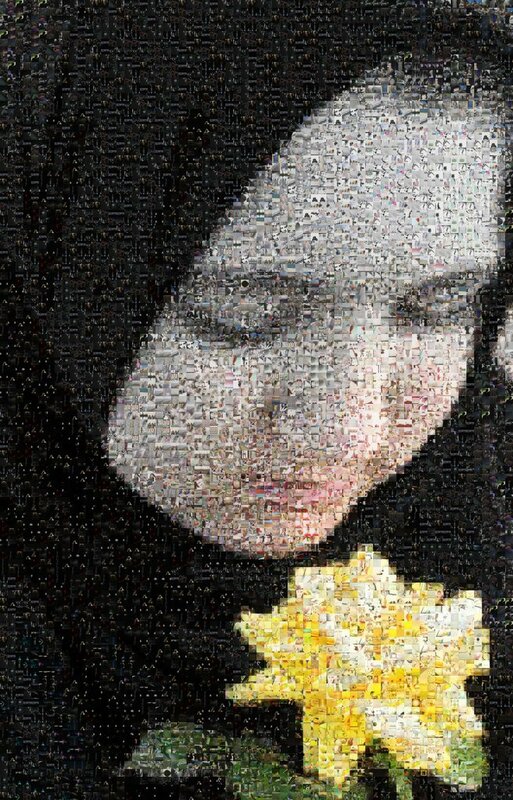 I found a mosaic generator online that will create a mosaic using what ever picture you upload. The images used to create it are from Flickr. This is the result of one of the images I uploaded - if you click on the image you can see it larger and get a better idea of the details - actually the website gives you an even larger and more detailed image but Blogger resizes the images smaller to fit on the blog. - The actual file from the site was nearly 4 megabytes. I think I'm going to have it printed and hang it on the wall next to my desk. Ramadan and Eid are over and things are getting back to normal again. The kids will be going back to school tomorrow and I'll go back to work. It will be nice to get back into the old routine again. I have been convinced for a while that Mustafa's hearing needs to be checked and now I am sure of it. How could he not have heard the banging and noise from upstairs? A few minutes later he tells me 'The new neighbour has started renovations upstairs.' Isn't that what I just said a few minutes ago? Maybe he's got Alzheimer's too. His hearing needs to be checked definitely. This would explain the reason why he turns the volume all the way up while he watches the news. I need to remind myself to add it to the list of things to do - check hearing. By the time the new neighbour has finished with renovating the flat we'll all be hard of hearing. Plans are to completely strip two bathrooms and the kitchen, putting in all new tiles. This requires not only banging but lots of dirt and dust and workmen in the stairway. They'll be rewiring the electricity and painting too. I hope they get it over with quickly. The new neighbour mentioned to Mustafa that he wanted to cut down the tree in the garden. He said he thought someone might climb up it and get in his house. That's MY TREE! The tree from my mother's garden in Florida! 'If he cuts down the tree, the first funeral he attends in this neighbourhood will be his own.' I announced to my husband. 'You better make sure he knows this. I won't have time to explain it to him before I kill him.' Imagine the nerve of that man.... wanting to cut down MY TREE! The tree only just reaches his floor. If someone climbed up the branches would not hold them - they would never make it to his flat. What on earth is that guy thinking? Things are getting back to normal . . .
Today was the third day of Eid. 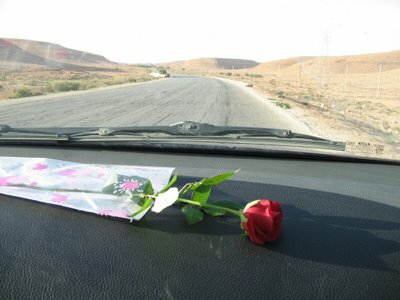 We decided to take Jenna and Ibrahim for a long drive setting off at almost noon and driving to Ben Walid. We'd never been there before and I wasn't sure what it would be like. I've got students from there who have always said it's nothing but desert. So I was expecting something quite different than what I found. 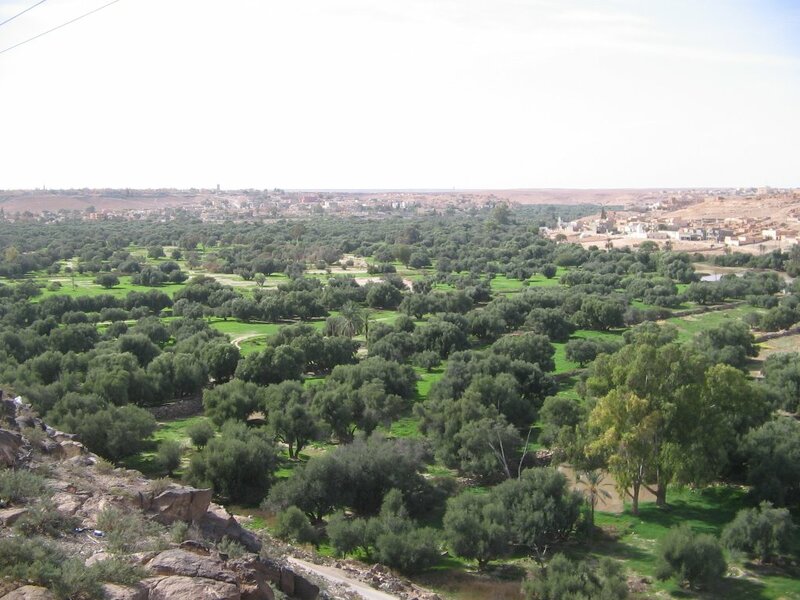 To get there you have to drive south of Tripoli and turn off on a road before you reach Tarhouna and from there it's about another 45 to an hour's drive. The terrain was indeed barren, rocky desert just as my students had described. There were also 12 different security stops along the way which was annoying but at least it made everyone drive a bit slower. When we reached the town we found something we weren't expecting. There are stone and rock covered hills that surround a verdant green wadi. How could my students have not ever thought to mention it? It's lovely! 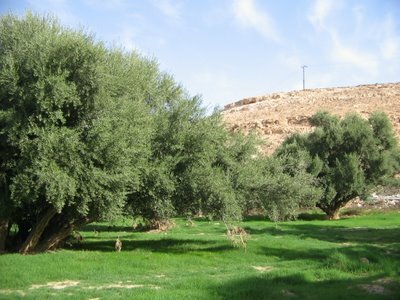 We drove around on roads that overlooked this wadi or green valley. 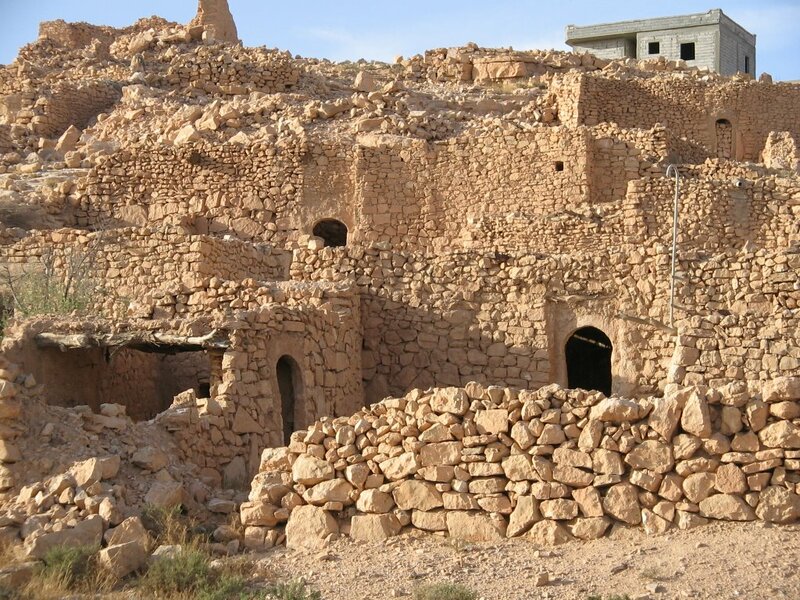 The surrounding area was mostly houses with roads leading to other parts of Ben Walid. We stopped at a supermarket and picked up some bread, cheese and tuna to make simple sandwiches, some cookies and some juice, orange soda and a bottle of water for an impromptu picnic. We drove down a narrow road that led into the valley. It was so green and this is the end of the dry season. We wondered what it must be like in springtime after the rains. We ate our sandwiches under the shade of olive trees and then we cleaned up our picnic and took a walk. 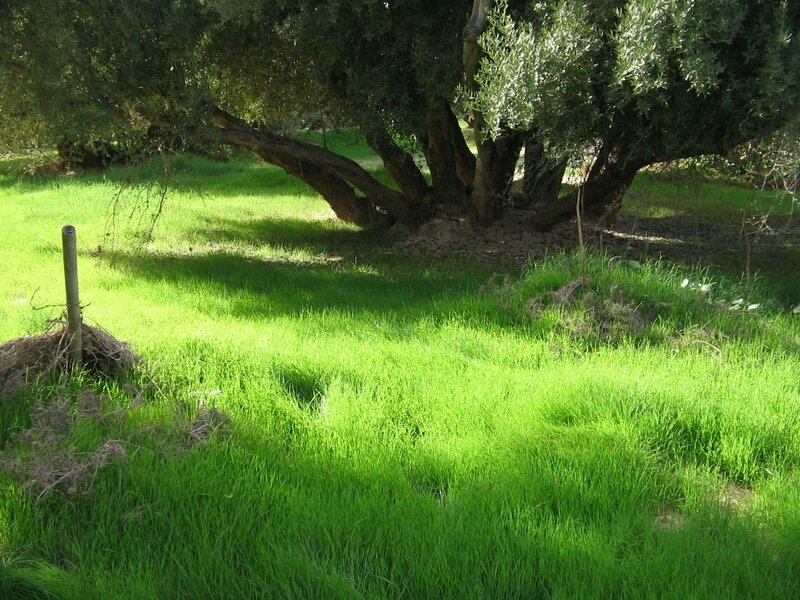 It was beautiful; birds singing, butterflies, small frogs jumping about, date palms and green, green grass. 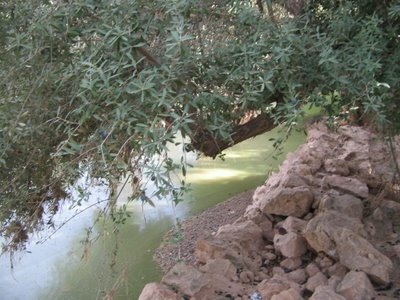 Jenna climbed up into an old olive tree - next time we go there we'll have to bring more suitable clothes. There were places where there was standing water. A bit murky and green and not inviting to swimmers. There were mosquitoes buzzing about but they only seemed to bother Mustafa. 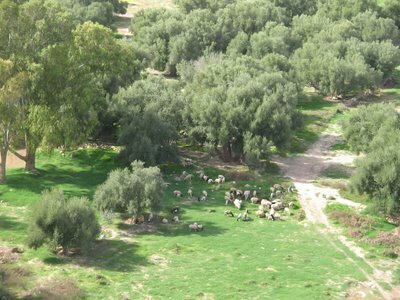 We came across shepherds grazing their sheep and goats and some families collecting ripe olives. We got back in the car and drove around exploring the area surrounding the valley. In some places you could see evidence of ancient dwellings made of rock. 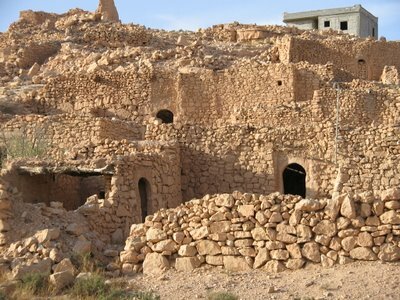 Most of the doorways had arched doors and the ceilings had the trunks of trees as a support for the roofing materials that were long disintegrated in most of the structures. We didn't get out to explore on foot, only looked by car as we weren't dressed properly for rock climbing. 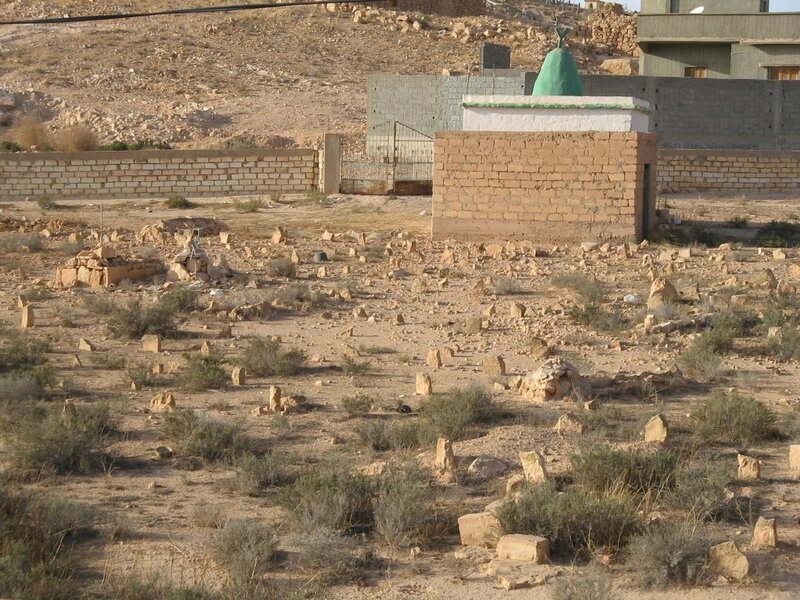 Along one road we found cemeteries with simple graves marked only with boulders or rocks. 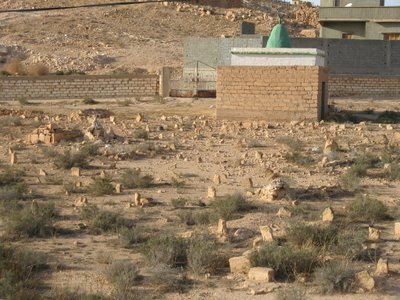 Occasionally there would be the tomb of a marabout, or holy person. We headed for home at five o'clock, dreading the stops we would have at each checkpoint. To our surprise at the very first stop the officers were giving roses to the women in each car that passed! It was a day full of nice surprises and a perfect way to end the Eid holiday. I hope you all enjoyed your holiday as much as I enjoyed mine. One of the things that's nice about Eid is that we arrive at my mother-in-law's house early in the morning and all have breakfast together. Nice hot black tea with mint, scrambled eggs, harissa (red pepper spread), cheese triangles, tuna, fresh hot cow's milk with nescafe, helwa shamia and a basket of bread. Yummy! The best way to begin Eid. Hope you're all enjoying the day! Ramadan is coming to an end and now we are all waiting (and counting the minutes) for Eid day. Adam arrived home safely this week so I feel my family is all accounted for now. I think he got taller! Now he only talks about when he returns next summer so I'll have to spoil him while I have him because he plans on staying away much longer next time. He's had a job offer for next year and we have this year to work out the details of his ongoing education. So for this Eid I'll have my kids all in one place, maybe for the last time. Adam brought me back a gift from my sister - an iPod. (Thanks Kris!) I wasn't expecting it, it's a pleasant surprise. Mustafa isn't thrilled with my new toy, partly because he's a technophobe and will probably never figure out how to work it himself, and partly because it's one more thing to keep my attention away from him (and he so wants to be the center of my universe). For instance, last night while we were driving in the car I had the earphones in, happily listening to soft inspirational music, all the while he was going on and on, complaining about this and that. I just nodded in agreement and he was totally unaware that I really wasn't paying any attention to him at all. Add this to the bonuses of wearing hijab: You can conceal an iPod under a scarf. I plan on putting the iPod to good use during the Eid. I've put enough podcasts on it to keep me entertained over the holiday. I'll be blissfully unaware of my sister-in-laws and their gossip and blah, blah, blah-ing about nothing. We're nearly ready for Eid. The clothes and shoes have been bought, the boys have all had their hair cut and we've been getting caught up with housework (God forbid the house isn't spotless and someone pops in to wish us Happy Eid). 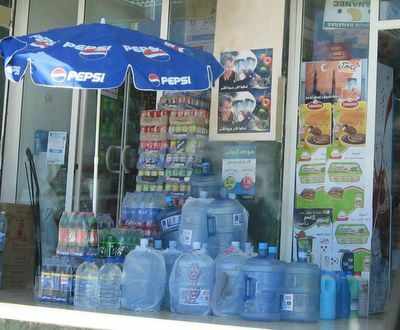 Today I'm going to stop at the shops and pick up softdrinks and sweets to serve to anyone that might visit. Most of the time will be spent at my inlaws but this year I have my own wheels so I'll be able to escape and visit some of my friends too. Add to the list filling up the gas tank before the gas stations get too busy and the lines too long. Did I forget anything? Oh yes. . . .
. . . . Have a Happy Eid! I spent the evening in the dark... with breathless, sweaty, middle-aged men. Is this KhadijaTeri writing this? Yes, it's true, I did spend an evening in the dark with sweaty, middle-aged men who were breathless. Get your mind out of the gutter! Exactly what was I doing? I was walking the horse track at the Foruseah, a popular place for people who want to get back in shape. ... and you were thinking something else...shame on you.. lol. We've gotten all the Eid shopping done and it seems we have all indulged foodwise this Ramadan, feeling out of shape and overfed. Our evenings are now free, so we've decided to get some fresh air and exercise in the evenings. The track is peaceful and quiet, the earth absorbing all the loud noises. The air is fresh with the exception of horse manure (but some people like that smell). The track isn't well lit at night which is nice because it seems more peaceful that way, without anyone able to stare or be stared at. Who's out on the track at night? Surprisingly there are lots of people there; couples, families, groups of women together and groups of men together, lots of middle-aged men with receding hairlines, children, I even saw an old woman walking with a cane, and there are horses with their trainers out too. Everyone is enjoying the chance to get some exercise. Some walk, others run or jog, some bring footballs to kick around the track, many talk on their mobile phones, there are some who prefer to listen to mp3 players and there are riders on the horses. I walk while the kids run and jog on ahead of me until they get tired, then they either stop and wait for me to catch up or they run back to me. We challenge each other to see how many times we'll make it around the track. The track is 1.4 km and so far we've managed to keep to about 5 times around each time we are there. Seven kilometres isn't too bad. Maybe we'll try for 6 laps next time. 'Would you take me to visit the family that lives on the farm next to ours?' my mother-in-law asked me this the other evening when I was visiting her. 'In the evening or during the day?' I asked her. 'Oh, during the day would be fine. Can you pick me up after you pick Ibrahim up from school? We could stop along the way and buy some juice and cookies for their kids.' she replied. 'Ok. Sure. I'll let you know the exact day later.' I told her. The neighbours at the farm are simple country people. The family has 18 kids; two of them have down syndrome and quite a few of the girls are a bit older and still not married. We usually stop by to visit them for a chat when we spend time at the farm, and my mother-in-law likes to drop in on them every year during Ramadan. We got to the neighbours and had a nice visit. The girls caught my mother-in-law up on all the neighbourhood gossip; who was getting married, who was building, who had been robbed recently, what they were growing and planning to grow, etc. I sat quietly and listened to the happy chatter. On the other side of the sitting room was one of the mentally handicapped boys. I judged that he must be in his mid to late twenties. He was sitting on one side a huge pile of unfolded laundry and on his other side was neatly folded and stacked laundry. One by one he was patiently folding the laundry. I've never seen anyone do such a nice job. I seriously thought about bringing him home with me! We all hate folding laundry in my house. After about an hour and a half it was time to leave. We said our prolonged goodbyes - saying goodbye always seems to take forever in Libya. Finally we drove off. My mother-in-law had a satisfied look about her. It was like she'd been recharged. When we got back to her house she asked me, 'How much did you pay for the bucket of cak?' I told her 'Two dinars, Hajja. There's a kilo of cookies in the bucket.' She was amazed. She looked at the cak and at the bucket and said 'Why do people bother to make this at home? The bucket alone costs a dinar and it probably costs more than a dinar to make the cak. Then there is the hassle of having someone take it to the bakery to bake it too.' She was inspecting the cak. They were actually very nice biscuits. They were machine made but the ingredients were the same as homemake cak. 'We're not making these at home anymore, not as long as these are available.' she announced. My mother-in-law's house goes through lots of biscuits and I know that she's always asking her daughters and daughter-in-laws to make them. They'll be able to spend their time doing something else now. I left Hajja in her kitchen. She was happy and satisfied. It was back home and into the kitchen for me. Last year at a computer expo in Tunisia they came out with these cute little laptops intended for kids as a non-profit One Laptop per Child project. 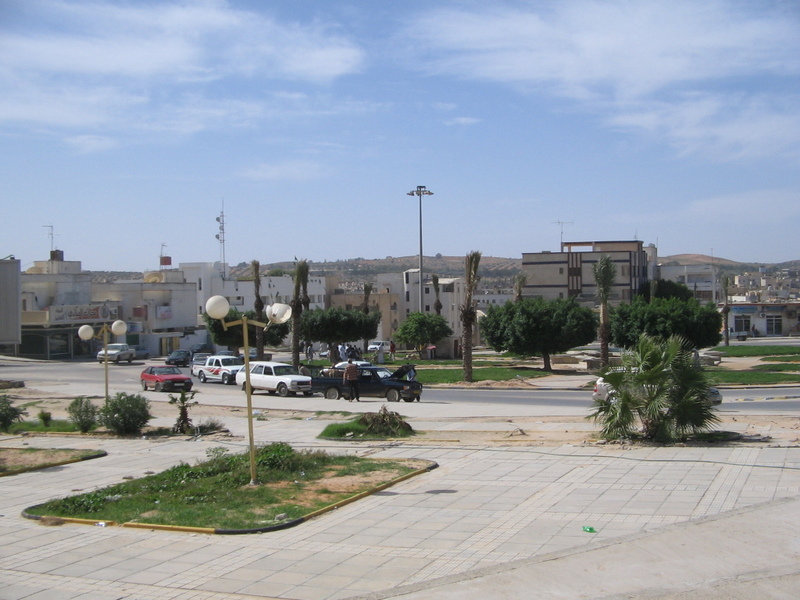 Now the organization will be piloting the project in Libya, expecting it to be completed by June 2008. Test models will be sent out as early as November of this year. 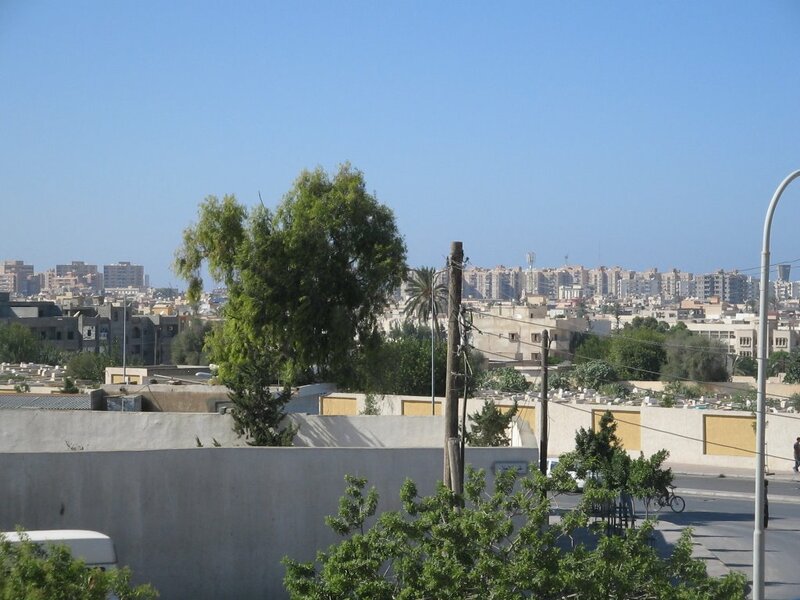 It's hoped that in Libya the organization will provide: 1.2 million computers, a server in each school, a team of technical advisers, satellite internet service and other infrastructure. The laptops are cute; small, bright green (not because it's the national flag's colour), run on Linux, and even run without electricity - using a handcrank or foot pedal when there is no electricity. The no electricity is a good thing because many public schools even in the capital don't have proper electricity in the classrooms. I'm excited that Libyan kids will be getting the oportunity to become computer literate. It's also good for all those that have graduated as computer programmers and engineers from universities and institutes to be employed as teachers. Of course the pessimistic side of me wonders how many of the laptops will find themselves on the blackmarket, and how will the children in outlying areas learn to use computers if there isn't anyone in the village or area that can teach them. Will students just waste their time on chat and games and forgo the richer side of the internet; research and the world of learning? But pessimism aside, I'm looking forward to this new development into technology in Libya. Will we see improvement in internet services here? 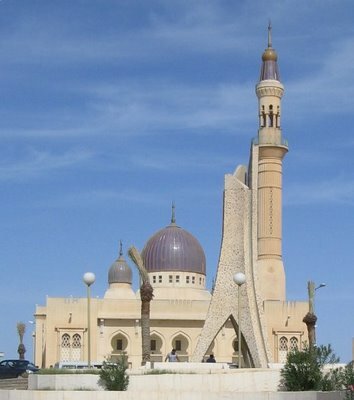 Will Libyans have a future as leaders in the world of IT? The possibilities are endless. And hey! I've got six kids! Yeah! Do we get six laptops!?! I'm so excited! I can't wait! Read it and consider yourself tagged if you want to be. What is that boy up to now? The shopping for Eid clothes is quickly coming to an end. (Thank God!) The clothes have been bought and now the only thing left is to buy shoes. Six pairs of shoes! Hopefully that will get done this afternoon. I've been taking the kids out shopping one at a time. It's actually not been too bad. I can focus on what one kid wants at a time and we get to spend some 'quality' time with each other. Time to talk (or argue) about things. The main problem I have had is what to do with Ibrahim while I'm out shopping. He's eight. He's hyperactive. He's a handful for anyone and while I'm away he's supposed to be looked after by his siblings. He needs constant supervision to keep him out of trouble. The kids are doing pretty good at watching him, but they don't always succeed at keeping him out of mischief. So what has he been up to while I am busy shopping? One day we arrived home to find him stripped down and standing in the bucket that my sister-in-law uses to catch the condensation from her air conditioner. He was having a fantastic time, pouring the cool water over his head. I got him upstairs and gave him a bath only to have him outside again a few minutes later playing in the water again. Lately Ibrahim seems to be having a fixation on water. He's been caught playing with the lighter a few times too, but I wasn't in the mood to take a picture of him then (too busy yelling and beating him). Another day when we arrived home we found him in the bathroom giving Jenna's doll a bath. He had used an entire bottle of shampoo to get the job done. 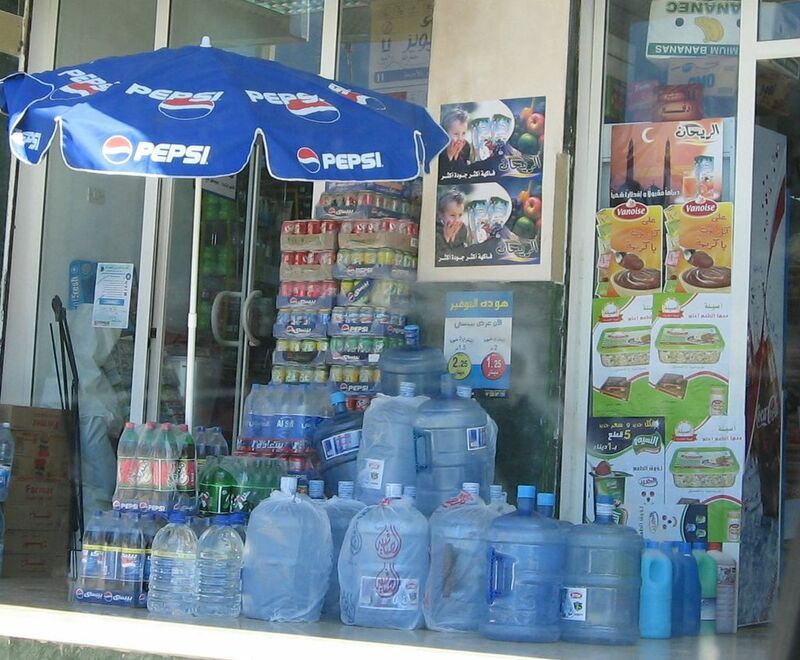 A bottle that I had paid three and a half dinars for the day before! 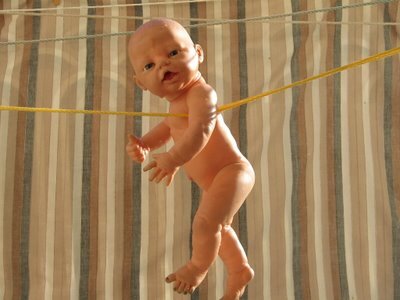 The shampoo was finished, the only thing left to do was rinse off the doll and hang it up to dry. 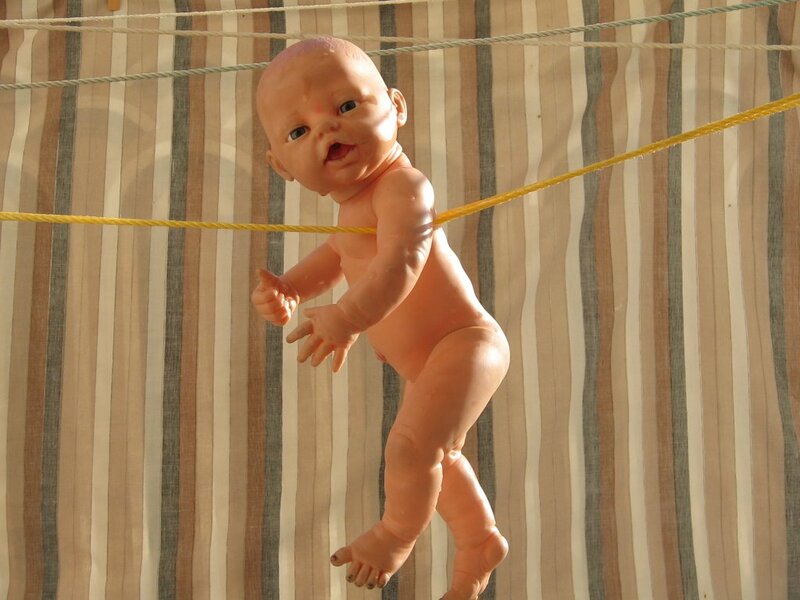 It looked kind of weird outside on the clothesline. Maybe I should have hung Ibrahim up there with it. . . sigh. . .
Another picture for the 'Where is this?' challenge. If you think you know where it is (or you want to guess) click on comments. Click on the picture to see an enlarged image. 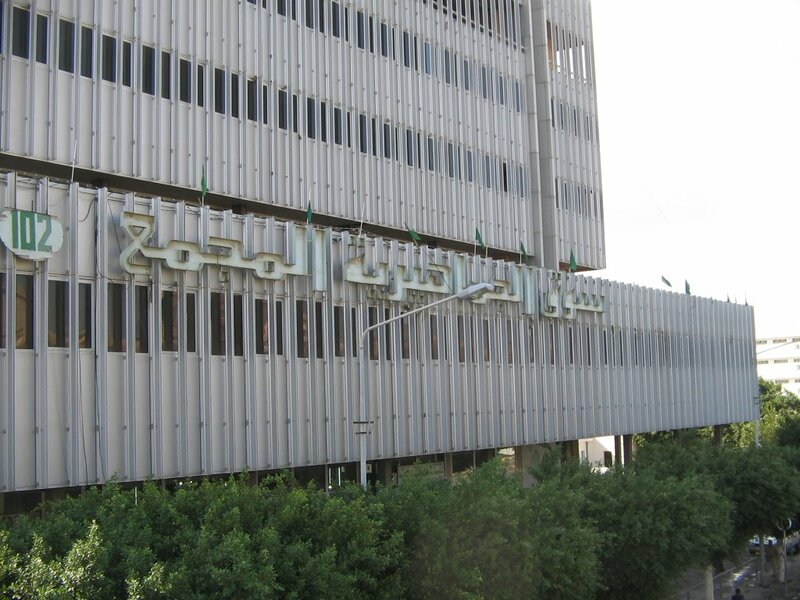 Maiuna had the answer when she wrote: i don't know the exact name, but is it the clinic at the corner of Aljamheeria street infront of Molai Mohamed Mosque? At the beginning of Ramadan I had to have some medical tests done (Don't worry I'm fine!) and when I went to pick up the test results they told me I had to wait another 30 minutes. Yeah! I was so happy to wait! It gave me an excuse to get my camera out and take some pictures. The girl at the desk must have thought I was crazy for being happy to have to wait. 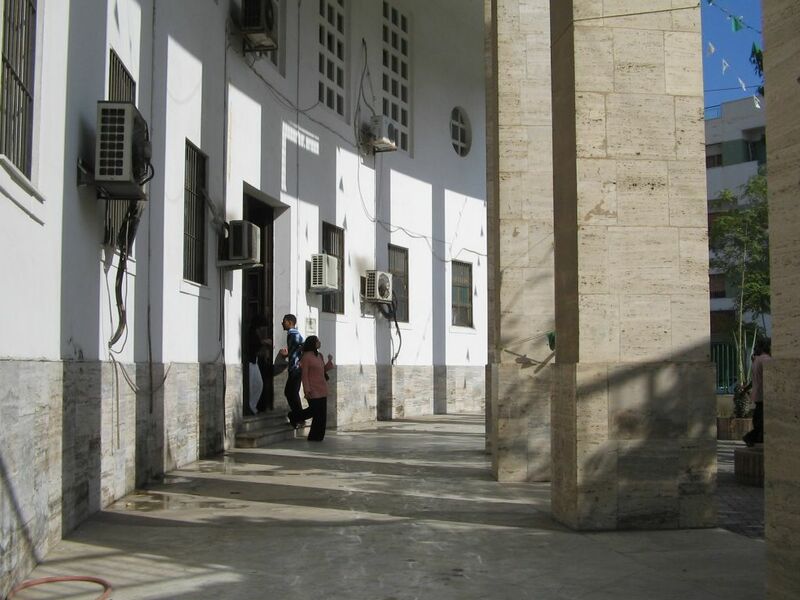 The building was built by the Italians during the Italian occupation of Libya. It's located diagonally across from the Central Hospital on Jamahiria Street. 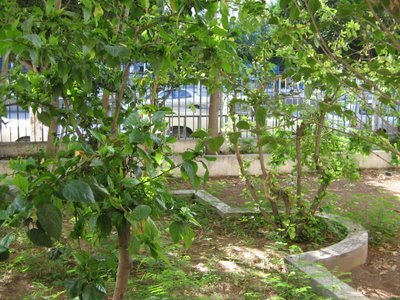 There's a small garden next to the building which houses the 'Reference Lab' which is basically the national laboratory of Libya. Across the street is Jama Mulay Mohamed Mosque which is really pretty. There's a pedestrian bridge that crosses Jamahiria Street and from it you get a fantastic view of the area. I rarely see anyone using the pedestrian bridges, people prefer to chance it and run across the road, but I always take the bridges so I can see the view (and keep from being run over by crazy motorists). 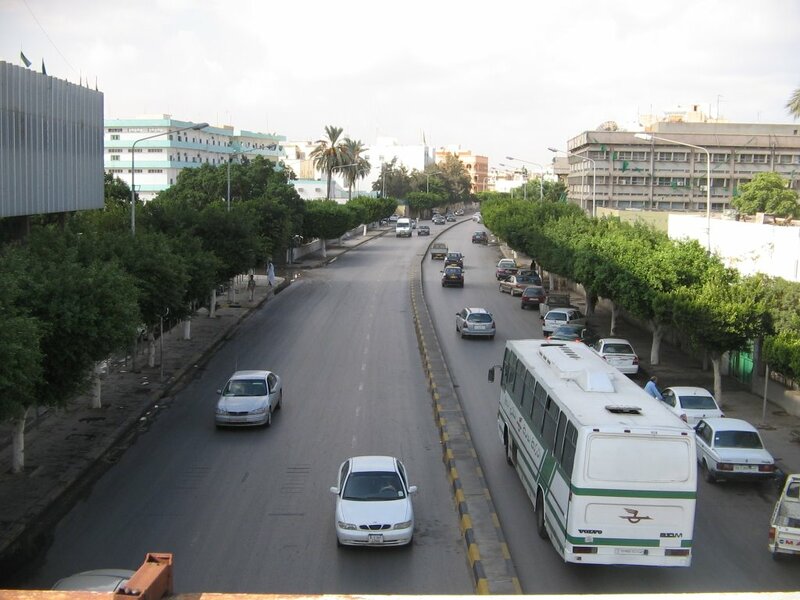 This is the view from the oposite direction, looking down Jamahiria Street. On the left you can see part of the old market. There's a bookshop on the first floor and a supermarket next to it. The market building. I'm not sure if the upper floors of the building are being used for anything now, in the past it was a government subsidized market. 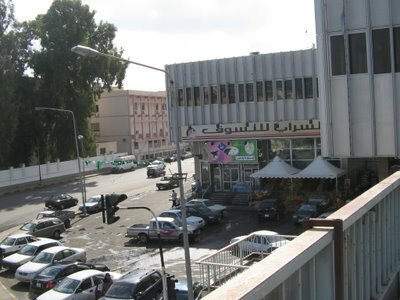 The view from the other side of the pedestrian bridge shows a supermarket and the beige/pink building showing behind the supermarket is the back part of the Central Hospital. They have been renovating that hospital since I got here in 1989 and it's still nowhere near to being finished. But the parts that are painted have the same colours that have been used for Jama Mulay Mohamed Mosque. It was another easy Where is this? challenge.... maybe it won't be so easy next time! 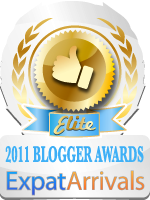 The Arab blog network, Toot sent me an email yeterday telling me they've added my blog to their list. Of course, I'm not an Arab and my blog's in English but there are other blogs by non-Arabs who are living in Arabic countries and blogging about their lives there too, so my blog fits right in. It's quite a collection of interesting blogs. Some of them are in Arabic, some English, some a mixture of both, and of course there's some Arabish ( a mixture of Arabic and English) thrown in for good measure. Stop over there and have a look. - and thanks for listing me Toot! I'm nearly finished with buying Eid clothes. I have only Nora left. I saved her for the last because she is miserable to go shopping with. So, tomorrow I will take her out and get the dreaded shopping trip over with. I'm glad that I've finished shopping pretty much early this year. There's new shops all over town and lots of choices. For the most part the shopkeepers have been polite and helpful. That really makes a big difference when you're out shopping. But as a rule I try to go out in the afternoon when most women are in their kitchens and the shops are fairly quiet. I wouldn't even think to try shopping at night. The roads are a mess then and the shops are packed. The only thing I've saved is buying shoes. I will take them all out at the same time and get that taken care of. There's a whole street devoted to mostly shoe stores and that's where we'll head for, park the car and just go from shop, to shop, to shop until everyone has shoes. Another picture for the 'Where is this?' challenge. If you think you know where it is (or you want to guess) click on comments. I think this one is super easy! For a closer look you can click on the image. I knew this one would be an easy one. 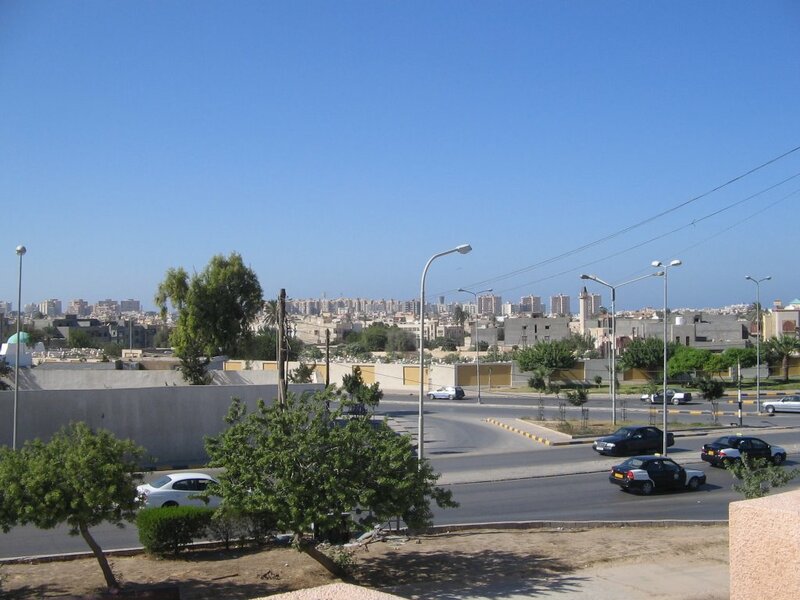 Dania's mama said: "it is the traffic light crossing 3arada street with alhani street .. i can see the makbarat(cemetery of ) alhani in the right end of the photo"
Yes, it's on the corner near Alhani. 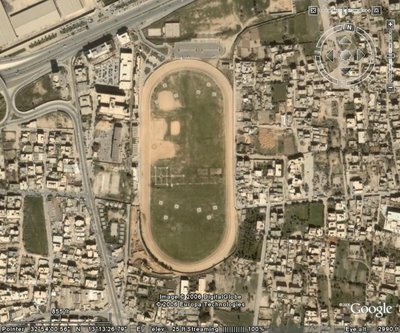 The other day Sara and I were out driving around and to avoid some traffic we took a turn and ended up in Alhani, on the top road that overlooks the main road. Sara said 'Hey mom! The view from up here is different.' So of course I stopped the car and snapped a few pictures. You can see all the apartment buildings on the horizon. When you're on the road below you don't see them. Sometimes taking a short detour not only adds to the adventure, but gives you a new outlook on things too. I'll keep taking detours! 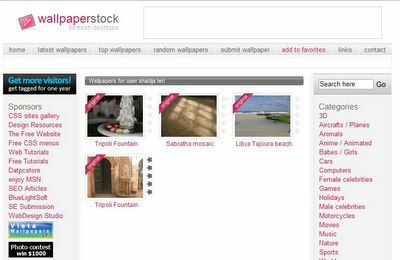 I submitted some of my pictures to wallpaperstock and they put them on their site. It's a fantastic place to find desktop wallpaper. Go have a look. Often when I mention and add blogs to my link list people are inspired to create their own blog or they'll suggest a link that I've missed. So here's a few more to add, and of course I will also add them to my sidebar for future reference. Gina's Big Adventure - An American woman makes a trip through the Sahara. She begins in Paris and continues on to Tunisia, then she makes her way through the desert to Togo. LU-TI - Piccolina, young, vibrant and full of life. Abughilan - from Gharian, who was inspired by me (!) to start blogging. Tears in Heaven - a girl from Benghazi, she's got nice pictures and poetry. Of course they'll be added to my ever growing list of links on the sidebar for future reference. I spend lots of time these days in various supermarkets and grocery stores. The shops are so packed full of goods you can barely fit through the aisles in some shops. There's quite a lot of variety too. Sure beats the old days when the men had to stand in line at the Jamia and the women sat for hours picking bugs out of bad rice. Nice to have a choice... but Ramadan is costing us a fortune in food. We've been spending at least 10 dinars a day just for vegetables and fruit. The lure to spend more is there... waiting in the shops. I've begun the chore of shopping for Eid clothes. I started shopping today. There's one particular shop that I like to shop at for Ibrahim and Jenna's clothes. The shop is quite small, but the selection is nice and the boy that runs the shop is very well mannered and polite. I stopped by the shop today while I was out running errands just to see what they had in stock. They had a few things I liked but the shopkeeper said he'd be getting more things a bit later in the day. I told him I would be back the next day. God willing, I will have Ibrahim and Jenna's shopping done tomorrow. Later I took Sara out and we found a beautiful outfit for her. She's hard to shop for because most of the colours that they bring here don't go well with her fair skin - they make her look ill. This season seems to be oranges, browns and greens, with everything cotton, embroidered and wrinkled looking. After looking in quite a few shops we finally found something perfect. We looked for shoes in a few shops but the ones we liked weren't available in her size. We'll have to look again. With a bit of luck, by the end of the week I will be finished with buying Eid clothes. Nora and Yusef will each need a day for themselves. It's a job I dread because of all the pushing and shoving and traffic, but I think that this year we've got it under control. I've decided to take each child out individually, spending time together and hopefully enjoying ourselves. By the way... no one has even taken a guess at the latest 'Where is this?' challenge.